With a Richmond win already on his 2015 resume, Kurt Busch tried to sneak in a a second checkered flag before the rest of the NASCAR field returns in September. That was, until a couple of kids had something to say about it. No it wasn’t a paddle-powered stock car. Kurt and the kids were out kayaking on the historic James River in advance of RIR’s upcoming race weekend September 10-12. Busch and Richmond International Raceway came out to the Passages Rock and River camp on the James, where the defending TOYOTA OWNERS 400 champ made the rounds across Richmond’s famous Belle Isle. In addition to splashing around in a kayak, Busch took to the air with some zip line action across the island's quarry. 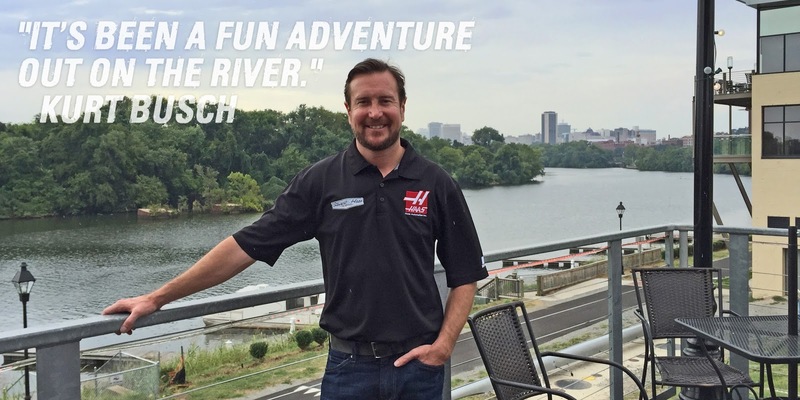 “I'd been coming to Richmond for 15 years, and I haven't been able to do something like (kayaking or zip-lining) here,” said Busch. "It's fun to jump in and do some outdoorsy things like that,"
And as much fun as the No. 41 driver had on the river, Kurt is looking forward to coming back to RIR in September for the Last Race to Make the Chase, the 2015 Federated Auto Parts 400.